The Daisy has held its importance in wedding ceremonies since ancient times, symbolizing loyal and everlasting love. This traditional flower holds multiple blooms per stem. The bloom of the Daisy looks spectacular, its petals evenly blossom outwards from its button like center. 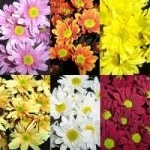 Our assorted daisies make a beautiful bouquet alone, or as an accent to your wedding arrangements. Get a fresh delivery of daisies shipped to your doorstep.